Once you start promoting people and letting them built their own towers, they’ll start begging you for teleportation platforms. You can mention extending the network to Llunela Hleran in the Telvanni Council House Hermitage at any time, but she won’t agree to build them until all four towers are complete. These builds won’t cost you any money, because it’s assumed the tower owners will be footing the bill. Once Llunela agrees to built them, it will take a week, after which you can visit all four towers and activate each one for use. Once Stoh-Gei takes over Telasero, Skink-in-trees-shade will ask about extending the network to its propylon chamber. Llunela will be happy to oblige, but only if the four towers have been connected to the network already. If you mention this to Skink before it can be built, he’ll get mad over his request being ignored. When Llunela is ready to build it, it will take only half-a-week to complete. The Uvirith’s Legacy RoHT patch adds the ability to recruit a couple more members from the Mages Guild if you decide to destroy it. You’ll find him in the Caldera inn Shenk’s Shovel drowning in his cups. He’ll mention his desire to journey to a dunmer stronghold, but thinks it too dangerous. At this point you can invite him to your tower, but he’ll only agree if you give him your teleport key. The next time you return to Tel Uvirith, you’ll find him in the guest turret in the upper tower. If you have the Master Index plug-in loaded, you now have travel NPC who will teleport you to any dunmer stronghold on your request. If you didn’t kill her before laying the Balmora Mages Guild to waste, she’ll follow Edwinna to Tel Dwemeris. You can find her in a small housepod outside. She’ll welcome you into her new home with a fresh-baked sweetroll. If you ask Ajira to perform chores for you, you can get all her reports back and ask her to write a new one about the local flora. She’ll take a day or two to scrounge up each one. You can also promote her. Asking her about a “little secret” will make her reveal the two magical items she tells you about for becoming her friend in the Mages Guild, if she hasn’t already. She’ll also tell you about a third artifact. After saving Zhariphel Mine, Eddie may give you a letter from Master Mithras, extending an invitation to you from the mainland. You’ll only get this letter if you’re not already a member of mainland House Telvanni. If Eddie gives you the letter, he’ll tell you there’s a Telannis teleportation platform in Tel Aruhn. Only with this letter with Dratha let you use her platform, and her key only works once. Once it teleports you to Port Telvannis, you’re on your own. You’ll have to join the mainland House Telvanni to get a new teleportation key. Requirements: Rank of Oathman in mainland House Telvanni. Once you meet the requirements, you can get a Telvannis teleportation key and use their platforms. Some are locked and require completion of certain quests before you can use them. Unlike the Vvardenfell platforms, you need the key on hand at all times to use Telvannis platforms. The main teleportation station is located near the Telvanni Council House. All other platforms lead to here. Must be constructed through a quest. Will be located at the bottom of the levitation shaft in the upper tower. Will be deactivated after constructing the Tel Uvirith platform. Is located in the new vault connected to the lower tower. In the passageway storage room. In a teleportation chamber at the bottom of the tower shaft. In the lower tower. Requires levitation to access. In a teleportation chamber in the lower tower. In Tel Vaerin: locked until you do a favor for the Master. Is locked until you impress Mistress Eldale with your riddling skills. It’s located in the Tel Darys lower tower. This platform is hidden, locked, and requires a separate key to use. The paranoid tower lord will only give you access over his dead body. This platform has been deactivated by the mad Lord Narrusa, and his councilor begs you to help build a new one to their suffering town. If you agree, he’ll hand you a letter to take to Master Mithras. Once the Helnim platform build is initiated, the grateful council will give you a reward, and a new platform in town will be ready to use in a week. Requirements: Tel Uvirith Upper Tower, Completing TR Telvanni Ranyon Run Quest. After you’ve done enough for Master Mithras to gain his favor, he’ll offer to sign a permit to built a Telvannis teleportation link to your tower. You’ll have to talk to Vero Renim in the mainland Telvanni Council House to get further details on building it. 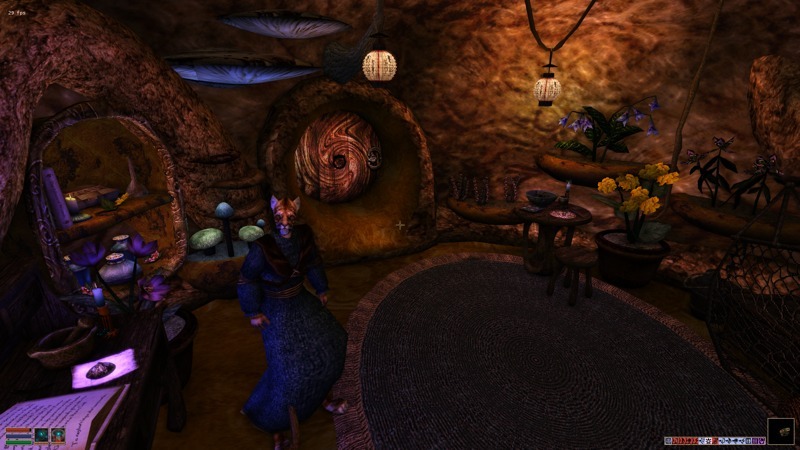 Vero Renim will demand you build a suitable platform at Tel Uvirith before he can link it to the Port Telvannis Teleport Station, and he won’t travel all the way to Vvardenfell. This means you need to get Llunela to do it, and it’ll cost you at both ends: 1500 gold in Vvardenfell, and 1000 in Port Telvannis. Pay Llunella the 1500 gold and she’ll start construction right away. It’ll take a week to complete. After that, head back to Port Telvannis and inform Vero that it’s ready. Pay Vero Renim the 1000 gold to link the platforms and he’ll get to work. Dratha’s platform will be deactivated at this time, because your link will replace hers, and yours won’t be ready yet—so you’re stuck there for a week unless you want to go for a long waterwalk. After a week, the highest platform in the Teleport Station will be linked to the Tel Uvirith platform, found at the bottom of the levitation shaft in the Upper Tower. Like all Telvannis teleport platforms, you’ll need the key on hand to use it.